This is an engaging book that I finished reading in one sitting. 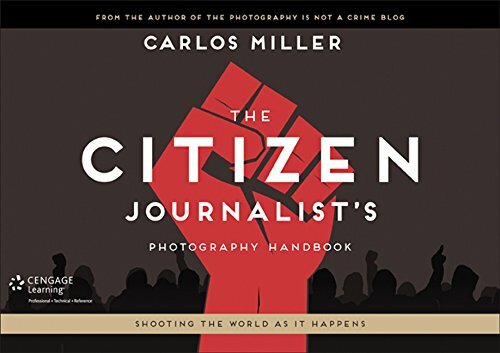 The book's written by Carlos Miller, author of Photography is not a crime. He's been doing his version of citizen journalism for several years, documenting the injustice of police and government systems in USA. It's an engaging read for several reasons. First, some stories you'll find inside are probably ones that you know of through reading online. For me, it was the story of police officers using pepper spray on protesters at the Occupy Wall Street movement. Another was about some police abuse story that I think I read from the author's blog. The second reason, is Miller has also included his personal story of getting arrested and having to go through the court system, only to find himself guilty of several charges. The last reason, and to me the goal of the book, is that it shows just how powerful citizen journalism is nowadays with the internet. This is not a step-by-step guide that trains you to be a journalist on the street though. It's a collection of stories that broke online, and the back stories and analysis that goes behind. Miller does offer some tips, using the examples, on how you can bring news that you create online. Some people are actually online vigilantes that take this very seriously. This book has useful information that photographers should find useful. In particular, it wants you to be knowledgeable about your own rights when it comes to shooting or making a video in public and other places, the complications that can arise, and the limits of the law. It also explains the ethics involved and guidelines to consider. It's quite an insightful book that I recommend to those in the media industry, regardless of whether you're with a so called established organisation or just some writer of a random blog.